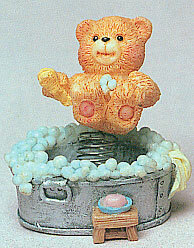 This is a part of a set of four bathing teddy bears. Collect all four to complete the set. This cute little ceramic elephant has gone on a shopping spree. She has a cute message on her tail saying "But It Was On Sale!". This is part of a set of Baby Teddy Bears on rocking chair, train, car, or bed. Collect all six to complete the set.